Every Sunday coffee hour follows church services in the Fellowship Hall at St. David Armenian Church. It’s a great way for parishioners to meet friends and, on occasion, enjoy a cultural event. At our last Women’s Guild meeting, Father Paren Galstyan asked if I knew what Ghapama was. I assured him I did, and that I even knew of a song which pays tribute to this traditional Armenian dish. I showed him the existing post on this very topic. 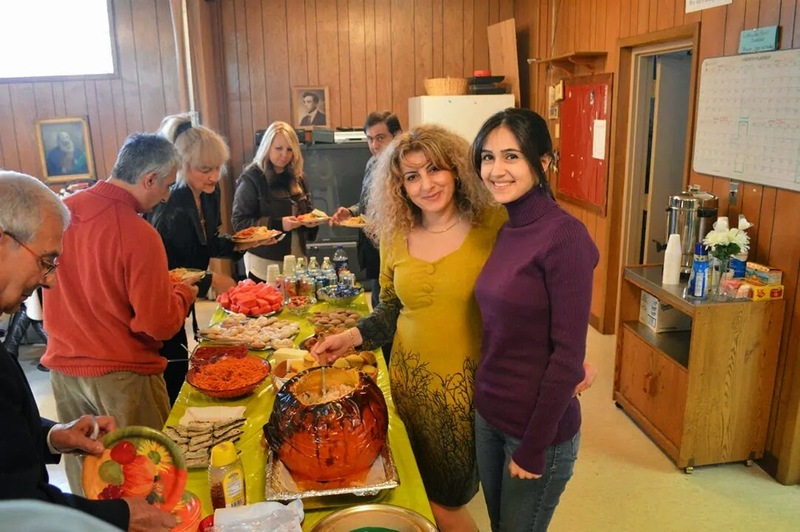 Yereztgin Anna, 2nd from right, serves her Ghapama to the congregation in their previous parish in the Mid-West. Father Paren informed me that *Yeretzgin Anna, is quite the ghapama expert. In fact, she will be hosting coffee hour on Sunday, October 26th with her special ghapama recipe. She hosted a similar ghapama event at their previous parish in the Mid-West to the delight of the congregation. * A special note to non-Armenian readers: 'Yeretzgin' is a term which designates one as a priest's wife. If you’re in the neighborhood on October 26th, please come to St. David Armenian Church, 2300 Yamato Rd, Boca Raton, FL. Church service begins at 10:30 AM. Then join us in the fellowship hall for a taste of this very special dish!